To prepare chicken, combine the first 7 ingredients in a large zip-top plastic bag. Add chicken; seal. Marinate in the refrigerator 8 hours or overnight, turning bag occasionally. Add 3 tablespoons juice to chicken mixture; shake well. Marinate in refrigerator 20 more minutes. Remove chicken from bag; discard marinade. Sprinkle chicken evenly with 1 teaspoon salt and 1/2 teaspoon black pepper. Place chicken on a grill rack coated with cooking spray; grill 6 minutes on each side or until done. Set aside. To prepare peppers, cut bell peppers in half lengthwise; discard seeds and membranes. Place pepper halves, skin sides up, on a work surface; flatten with hand. Grill, skin sides down, 15 minutes or until blackened. Place in a zip-top plastic bag; seal. Let stand 10 minutes. Peel and cut into strips. Combine peppers, basil, and remaining ingredients in a bowl. 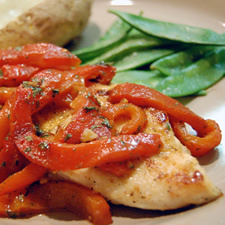 Arrange chicken on a platter; top with peppers. Per Serving (per each 6 ounce prepared chicken breast): 236 Calories; 3g Fat (12.2% calories from fat); 1g Saturated Fat; 41g Protein; 10g Carbohydrate; 3g Dietary Fiber; 99mg Cholesterol; 647mg Sodium. Exchanges: 0 Grain(Starch); 5 1/2 Lean Meat; 1 1/2 Vegetable; 0 Fruit; 0 Fat.